What is the Carpet & Rug Institute? Hello Carpets & Floors is proud to offer services, solutions and equipment in our carpet cleaning that features the CRI Seal of Approval. 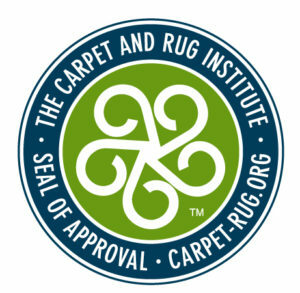 The CRI (Carpet & Rug Institute) Seal of Approval is given to products and equipment that pass a rigorous scientific test created by the CRI. The test measures how well a product cleans carpet. If a produce features the CRI Seal of Approval, consumers and companies can feel confident the product will perform as advertised. The CRI scientific test includes several factors and criteria for a product to receive the Seal of Approval. The factors include soil removal efficacy, resoiling, residual moisture, surface appearance and more. These factors are able to determine not only how clean a carpet looks after a product is used on it but also how healthy it is too and how likely it is to remain clean for the foreseeable future. If a product passes all of the tests it will receive the Seal of Approval. The test is used on cleaning solutions, cleaning equipment and processes and systems used for residential and commercial cleaning services. The Seal of Approval is great for consumers deciding which carpet cleaning company in Portland to hire and it is good for manufacturers and cleaning professionals too. The manufacturers can use the grades from the scientific test to improve their produce while cleaning professionals like Hello Carpets & Floors can earn certification from The CRI if they choose to use products with the Seal of Approval. You can find the entire list of Seal of Approval and Green Label products on the CRI website and you can also locate local service providers that advertise the CRI Seal of Approval and certification. Our Seal of Approval products and CRI certification separate us from other steam cleaning companies near Portland, OR. Hello Carpets & Floors is confident our solutions provide safe and superior results for businesses and homeowners in Beaverton, Tigard, Lake Oswego and Portland.